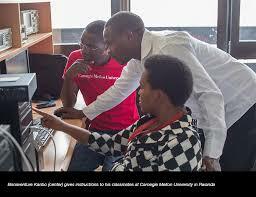 Carnegie Mellon University (CMU) in Rwanda has graduated its first class of 22 students with master’s degrees in Information Technology. The graduation ceremony, which took place at the Serena Hotel in Kigali, highlighted CMU and Government of Rwanda’s commitment to educating engineers and entrepreneurs who are striving to make an economic impact in East Africa. Many of the students aspire to be the next technical innovators and business leaders. In 2007, the International Telecommunication Union, the United Nations agency for information and communication technologies, recommended establishing Centres of Excellence throughout Africa to cultivate the science and technological skills required for developing an IT workforce and expertise in Africa. CMU became the first U.S. University to offer master’s degree programme taught by full-time faculty resident in Africa. The institution offers the students a world-class education enriched by the institution’s history and tradition of excellence that began in the United States in 1900. Rigorous coursework, practicums and internships provide students with the critical skills valued by industry throughout East Africa. To ensure that Carnegie Mellon University’s research and curriculum in Rwanda remain relevant to Africa, the faculty and students engage with local companies and multinational corporations on a continual basis. Companies that have recruited CMU students for internships in East Africa include General Electric, IBM, Marriott, Microsoft, VISA and Voxiva. “Being present in East Africa is the only way to understand the region’s technology needs. Creating a long-term education programme is critical, because it gives students time to analyze problems and develop solutions in the context in which they occur,” said Bruce Krogh, the inaugural director of CMU in East Africa. CMU offers two graduate degree programmes: its founding programme, the M.S. in Information Technology, and the M.S. in Electrical and Computer Engineering launching in August, 2014.